Welcome Dead Heads! So, was that episode a little better for everyone? The intensity most certainly picked up. The gore factor was at a level that we've come to expect on the show. (There was at least one sequence where I almost turned my head) Yet still, all of the story-building that happened in the first half of the season continued to play out in a way that, to me, was more meaningful due to the time they took in setting it up. I'm sure season 3 will do a better job with pacing to keep all of the fans more satisfied, but I have no issues with the journey we have been taken on this season. The crazy thing is, this show must be one that fans LOVE to be frustrated with. The ratings keep growing at an exponential rate! It's nuts! Okay, let's get into a quick dissection of the episode. So, we last left off Lori in a terribly contrived car accident where we just assumed this would terminate her pregnancy. NOPE! Lori was just fine in that flipped over car. Except for one thing. That walker she hit wasn't too happy about it. He was working his face through the windshield of the car. Lori, doing something other than whining about Rick and Shane and Carl for once, took matters into her own hands. Now, it would appear that there was just a screwdriver hanging out in the car that she was able to gouge into the walker's eye. It may have been a window handle on the door. But, I guess in these dark times you may not leave the house without a screwdriver! The fun wasn't done though. There were a couple more Walkers out for some human meat. Luckily, Lori found a gun lying around too and used it! I guess we're getting past the point of being scared of using guns! It didn't take long for everyone to put the pieces together and realize Lori went after Rick. This set Shane off. It didn't take him too long to track her down. 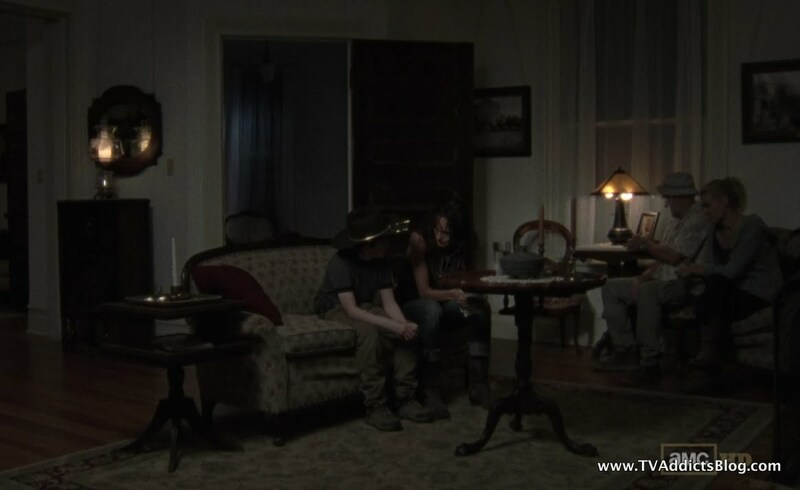 Shane lied to Lori to get her back to the farm. He told her that Rick and crew were already back. He probably made the right call there, but of course, there was something else going on with his intentions. Shane expressed his love for Lori and Carl to Lori. He talked about the time when they thought Rick was dead. They had something special and it was a long time coming. While Lori disagreed with Shane, I thought there might be a hint of her agreeing with him. Shane also found out that Lori told Rick everything. His reaction seemed to be out of concern for his friend, Rick. They thought he was dead and it was a mistake. But, clearly, he has some mixed feelings on the matter. Elsewhere, Daryl still does not want anything to do with the rest of the group. He is grieving for his efforts of trying to find Sophia. And the show is doing their best to make him the 2nd coming of Sawyer. Carol was doing her best to let him vent and pleading with him to not beat himself up about Sophia. Daryl went on a rant blaming Carol for losing Sophia in the first place. And he refused to take onus on the bond that formed between the two of them. So, for now, Daryl will remain a loner. But, I'm sure something will come up that will force him to work with the group again. So, after Rick had shot Philly Dave and Tony in pure self defense, they planned on returning to the farm. But, it would seem that Dave and Tony were not alone. Their people came looking for them. And the drama ensued! All we heard were voices outside the bar looking for their "Friends". I loved the line, "Dave and Tony are missing and no one thought to check the bar?" Good times, of course not for our heroes! Lots of suspense and intensity led to Rick finally yelling out at their rivals. He said that they were drawn upon by Dave and Tony, and they had no choice but to shoot them down. It's just a sign of the times. Obviously, this answer was not sufficient for the outsiders. We ended up being in an all-out gun fight! As always, Rick gave Glenn the toughest task of going to get the car while Hershel covered. We learned that Hershel knows how to handle a weapon as well, even if he doesn't like to. Glenn ran for the car and got shot at. He then froze, forcing Hershel to shoot a dude and Rick to come to Glenn's rescue. Why did he freeze? We'll get there. Just as the Farm crew was assembling to go get Hershel, Rick and Glenn they rolled up introducing a new conflict for everyone to chatter about! We learned that this newbie's name is Randall. After a quick Google search, I can tell you that Randall is not a character from the graphic novels. Randall was blindfolded on his trip to the farm. Rick's argument is that his friends left him for dead and they couldn't just leave him there. They were planning to fix him up and then set him off on the road with a canteen. Shane and a few others were vehemently against this idea. They are just begging for a war with these guys if they set him free. Or they're just setting up up as Walker bait. Hershel finally got a chance to tell Shane to shove it. Basically saying that it's his farm and if it wasn't for Rick, Shane would be outta here. This led to an infamous Shane/Andrea discussion about what's right for the group. Andrea is totally on Shane's side saying that he has done more for the group's survival than anyone else including Rick. But she told Shane it's in his presentation that needs work. She said that they need the two of them since they're the only ones that see what's coming. I wouldn't agree with that. We heard Dale hinting at this whole "Needs of the Many outweighing the needs of the few or the one" Star Trek argument back in the season premiere. He knows the mindset that Shane has and he just doesn't agree with it. He believes they need to hold onto their humanity, right or wrong! Had to love when the group rolled in. We just assumed Maggie was going to hug her father before Glenn, but she ran right past him to Glenn. Good stuff! Later Maggie expressed her anger at Hershel for leaving to get a drink. She said she didn't know what to do when he was gone. 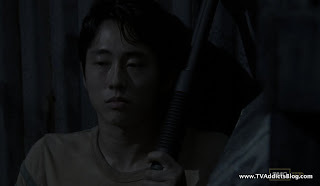 But Glenn was actually mad at Maggie for her expression of love before he left. He said that he froze out there because he was afraid of abandoning her. Now, he most definitely loves her too but is mad that he let himself get attached. So, he stormed off for now but I'm sure there's more to come there! Andrea and Maggie also shared a moment with Maggie's dehydrated and in shock sister. Maggie told a story about siblings having fun with birth control pills while Hershel had no idea what was going on. Clearly, Andrea was identifying with the story since she had a sister too who was recently taken from her. It would appear that Beth is not in any danger of becoming a Walker or anything just yet. But, we'll keep tabs on this story. It still seems weird that she would touch a walker and then just all of a sudden be unconscious with a fever and dehydrated. But whatever! 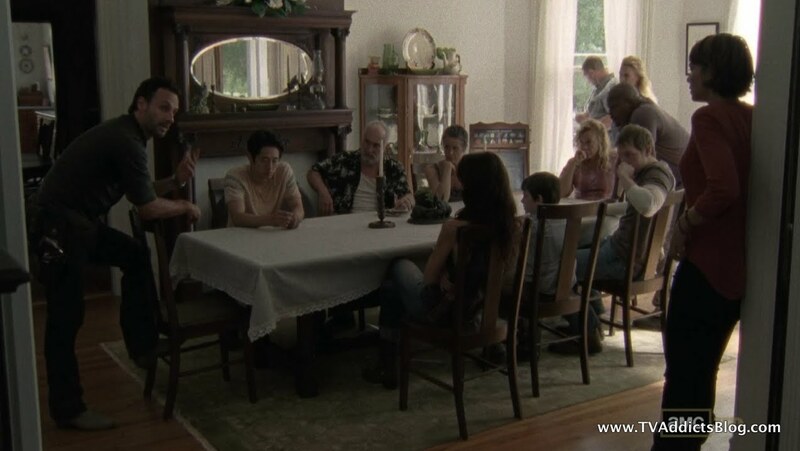 Oh yeah, and I totally forgot to mention above that Shane accidentally let Carl know that Lori was pregnant. Carl was initially shocked but came around on it being excited to be a big brother. Lori was more concerned about having "THE TALK" with Carl. Loved Dale's "don't look at me, that's the dad's job!" The big cliffhanging moment happened when Lori and Rick were alone in their tent. Lori decided it was time to reopen the awkward story of her and Shane. She thinks Shane has become a danger to the group. Why? Because he's still in love with Lori. She brought up how she's pretty sure Shane killed Otis. And while it may have partially been to save Carl, it was also because he's in love with Lori. He thinks that Lori is his and that the baby is his and he doesn't think Rick can protect them. Rick identified with Shane as he killed people today because he loved Lori. Killed the living to protect what's his. So, we all see where Lori is going with this right? Shane is a liability and WILL kill Rick if it means saving Lori and Carl all for himself. So what is she implying? Yep, it's time to off Shane! WHAAT!?!?!?! We've come a long way since Rick shouted the words "We do not kill the living" to Daryl last season. I'm not going to do much of speculating on what's going to happen with Shane this season. But, there is plenty of information out there in regards to the graphic novels and TV-related news that could allow your minds to speculate further! While one fate seems very likely, I still see this going either way for now. In the meantime, we have some intense drama ahead of us to close out this season! I'm looking forward to it. And for now, that's all I got! Hope you enjoyed my ramblings and I'll see you next week! As always, there are other shows that I watch as well and would be happy to discuss with all of you in the comments of any of these blogs. I thought for sure that when Lori grabbed that hubcap that we had a beheading coming ! LOL too many horror movies in my past. But that guy smushing his face and losing skin thru that windshield was nasty ! And good. ;-D i think Lori had that gun with her when she got in the car by the way. And Shane's like should have been obvious to Lori - why whould Rick send Shane to come get her ! But I'll go with it. Feeling that Daryl kinda feels that everything he touches turns to s**t so that is why he's on his onw - but I could be assigning more depth to him than there is. I actually think Rick was wrong with saving this guy. I have always found it interesting the differences bethween Rick and Shane even though they were both cops. But Rick was out cold in the hospital - he wasn't around for those early hard weeks. We never saw how they all came to be a group really but I'm sure they went thru alot of things and had to do things to get to their safe haven camp. So for Shane it became this is all we have and we need to do whatever it takes to keep it and protect it - and to keep us all safe. There are alot of bad survivors in this world too. So while I don't agree with Shane alot - I understand what drives him. But I don't think it was smart of Rick to bring this guy back at all. But that's one of the things I like about the show - the question of what is right and wrong is out the window from what it used to be - so it's case by cse situations now. Def feel a big showdown between Shane and Rick is coming. Have you seen Once yet ? I have seen Once and thought it was great!! All I can say right now since I'm on my phone but feel free to write more. I have the day off so I'm spending it with the kiddo! I'm not lucky enough to have off today, so I'll be more than happy to write some stuff on Once. Abigail is awesome! Loved that she didn't want to marry James either. But what in blazes happened to Katherine?? More importantly though, the writer guy- August- what was he doing with the book? Making a copy? Altering it? Adding pages? I guess what he was doing depends on whether he's good or bad. And that's something I'm still not certain of! Oh, and I was able to watch the premiere of Awake on my cable's On Demand, and you're right, Mike- it was great! The picture quality was nothing short of amazing- you can see pores and sweat and all that (as you said before, right Mike?). I will hold off on any further theories and the like until everyone has seen it. But I definitely can't wait for this show to be out and about! Yep, I mentioned those PORES on the faces! BTW...i posted links to HULU, AMAZON and ITUNES on the home page of the blog for anyone that wants to watch AWAKE. I wasn’t sure which part was gonna make you almost turn your head, Mike. For me, the walker in the windshield, the guy getting his face eaten, and Rick pulling that guy’s leg off the fence all made me wince! Definitely more gore and walkers this week! I kinda felt like Lori came away from that wreck too easily, but she showed how tough she can be without either guy there to “save” her. I also took notice of the close contact she had with those walkers since we don’t know yet what’s going happen with the sister who is still out of it. I was half expecting for Carol and Daryl to kiss all of a sudden when he was yelling at her. Still think it may happen at some point. I think Rick made a mistake saving that guy. I think Hershel’s choice of putting him out of his misery would have been safer. I only see bad things coming from that, but like MJ said, the line between right and wrong is blurry under the circumstances which is what makes this show interesting. Lori sure got upset with Shane and pretty much threw him under the bus with Rick! What an ominous expression on Rick to close the show! BEWARE! I watched Once, but have to get back to work now. Will comment later. Have you'd checked out the show called Comicbook Men (Kevin Smith show) that airs after Walking Dead now ? I just watched the premier - episode named Junk - and it featured the Collingswood Flea market. Watched Talking Dead this week and they said that the title Walking Dead refers to the people left alive - not the walkers ! Interesting. Once: Yeah it was like he was washing something into that book, or out of it ? Charming in Storybrook is NOT so charming. I was so mad when he lied to Mary Margaret and did not tell his wife. @Leslie - I think that was what they definitely were trying to show with Lori. She can take care of herself without the guys' help. As for Carol/Daryl, I think they want us to be thinking that could happen at any time too. lol As for Rick....yeah, he probably did make a mistake. Shane is making the right calls for the Zombie Apocalypse...but Rick is still making the humane calls. It's tough to let go of being a decent human being. I agree, it's a fine line between right and wrong. I've been reading a lot of Lady Macbeth references to Lori in that scene. EW's weekly interview with Rob Kirkman said that it could be just a scared wife/mother who doesn't know what to do and not necessarily her manipulating Rick. Pretty crazy though! Should be interesting to see how Rick decides to react. Also, it's tough to say if Shane would kill Rick. He seemed geniunely worried about his friendship with him when Lori told him that she spilled the beans. @MJ - Yeah, I have to admit TALKING DEAD is a guilty pleasure Monday morning ritual for me! As far as the title referring to the living, I think I had heard Kirkman or someone say that before. It makes sense. They pretty much are "EVENTUAL" dead people walking. It's just a matter of time before they meet their maker (or undead maker)....And it works on many levels...including the whole "survival of the fittest" mentality and losing the pieces of you that make you human. Killing people in cold blood for survival. Yeah, I get it! For my 2 cents on Once, I think the Writer was making additions to the book which does imply he wrote it, but I hadn’t taken it a step further that maybe he was making changes that might change the history. Hmmm…interesting. When the guy came across Kathryn’s car off the road, I recognized that he was Frederick in fairy tale land, but didn’t know if we had seen him before, but then I realized that Kathryn ran into him in the school hall when she went to tell off Mary Margaret and they didn’t seem to know each other. It looked like he was the soccer coach. Mike, you’re so right about David just trying to avoid confrontation, but it sure did backfire on him. I felt sad for Mary Margaret…just when she thought all would be OK, and it fell apart all around her. So - is Kathryn now in a cell next to Belle ? Hmmmmm. 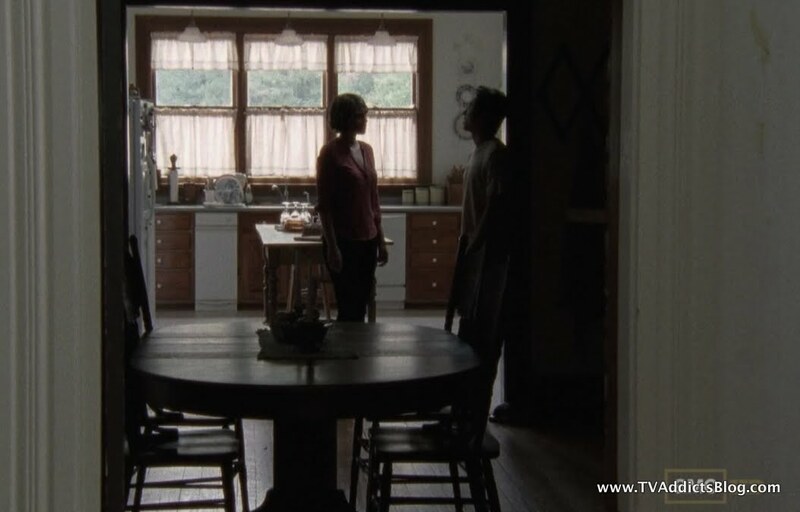 TWD: Besides showing Lori being capable of taking care of herself I think it also served to create the latest argument with her and Shane and was the spring board for her to decide once and for all that he was trouble. Funny - I did not think that Lori was manipulating Rick when I watched it, more like warning him that it's worse than he thinks since they never really discussed him and their affair. Every other place I read (and Talking Dead) felt she was manipulating him. So I'm glad to hear that the showrunners are saying it minght not be manipulation. Collingwoood - I'm in Woodbury so only a couple of litte circles away. Have never been to the flea market but have heard of it. Collingswood has been resurging lately - had alot of newer and trendy restaurants from what I hear. @Leslie - we did see "frederick" earlier in the episode in the school (yes, the soccer coach). He bumped into kathryn and said "excuse me" or something like that. It was so blatant that I was thinking "well, he has to be important" lol then he showed up in fairy tale land and at the end of the ep. But I don't think we saw him before. With the writer, agreed it doesn't imply he wrote it but he had made a comment suggesting it's not his first time to Storybrooke before. So he MAY have written it. @MJ - Interesting idea with Kathryn being hidden like Belle! Collingswood isn't too bad. Agreed on the restaurants. My brother did some plays there, so every once in a while we'd head there to see them and meet up for dinner. Mike, I think you misread what I said. I agree with you that they ARE implying the writer guy DID write the book. I didn't think that Kathryn may now be will Belle, but that makes sense.